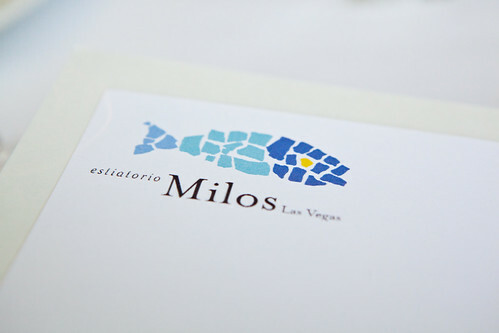 I read around the food forums, namely Chowhound Las Vegas raved about Estiatorio Milos‘s (commonly known as Milos) Business Lunch prix fixe deal. I know there is a Milos in my neck of the woods of New York City but the Vegas location is inexpensive if you compared to both. Beyond that, it’s quite a steal for eating in an upscale restaurant on the main Strip for $25 and change (including Vegas sales tax and 20% tip). My little tiff would be the uneven service, which I’ll explain later. 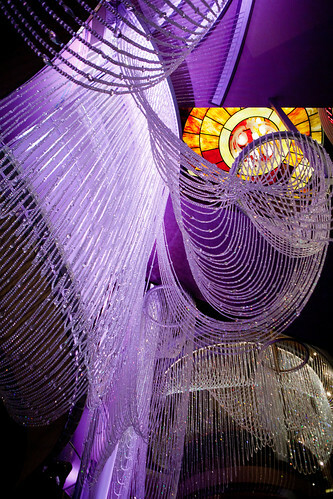 As we walked through the gilttery, crystal chandelier-ed lobby of The Cosmopolitan, it’s relatively tame for an entrance (if you compare to Wynn or the Venetian). 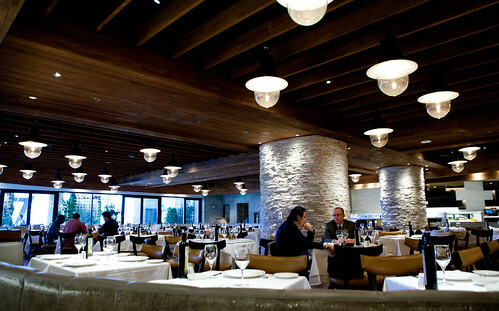 Riding up the escalators of the third floor, where most restaurants are located, we entered the entrance to Milos. We requested seats at their patio and was escorted there. 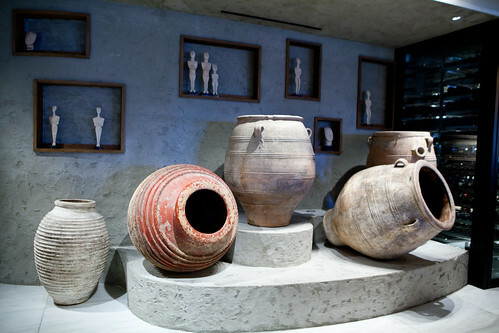 The dining room was a large and airy space transported me to the Greek islands with its enormous clay pots and antique-looking statuettes at the front of the main dining room. There is a large open kitchen on the left and a long seafood bar and bar on the right. 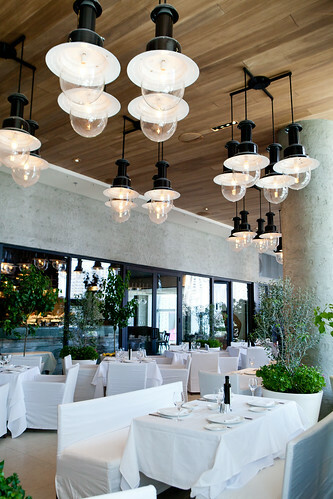 The patio is about one-third the size of the dining room but still feels spacious with its floor-to-ceiling windows, covered in thin white drapes, thin enough to see the Strip but still give shelter from the unbearable sun of Vegas. We were welcomed by our waiter and gave us the lunch menu. After ordering, we’re presented with a simple basket of warm, grilled country bread and intense fruity, Greek extra olive oil. Our first courses were shrimp saganaki, grilled scallop, and hortopita. 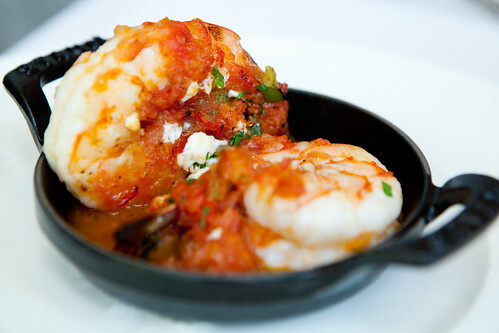 The shrimp was the best of the three, as they were palm-sized prawns that’s perfectly cooked with wonderful tomato sauce and a sprinkling of feta cheese. 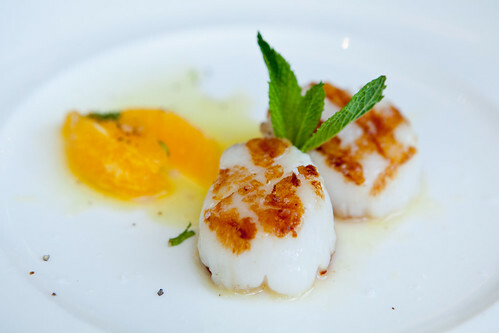 The grilled scallops were cooked up to a opaque pink center and simply dressed with orange segments and fresh mint. 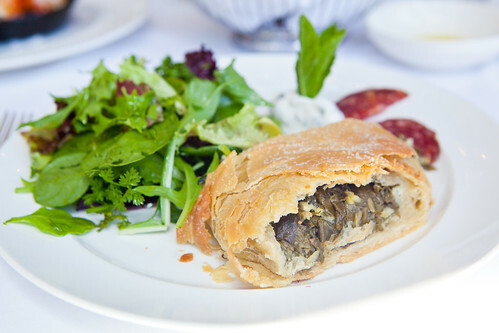 The hortopita is a traditional Greek savory pastry made of flaky phyllo dough sandwiched with greens and feta cheese, with a generous helping of salad and a few slices of salumi. If you were to look for something hearty, the hortopita is your ticket. 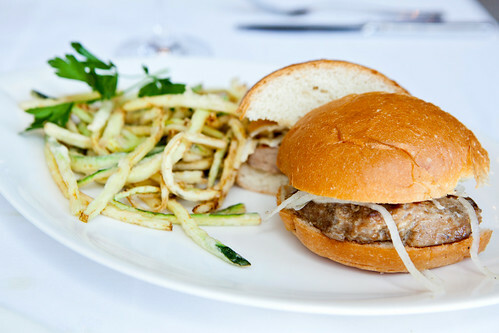 Our second courses of lamb chop, fries and steamed asparagus, tuna burger with zucchini fries and lavraki with horta were overall good. 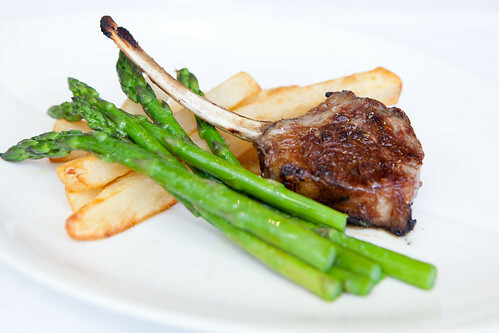 The lamb chop was simply grilled yielding to a juicy medium-rare but the fries were pallid and soft. The tuna burger was fine as they finely ground the tuna and packed it a bit more than I’d prefer (photo of burger cross section) that it lacks juiciness and it was dense. The zucchini fries were pretty good though; done shoestring style that it’s crisp and light. 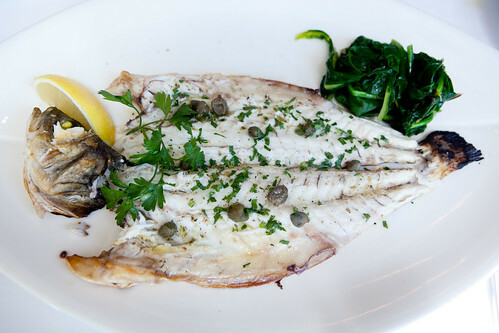 The star of the three was the lavraki with horta – a deboned, grilled branzino topped with capers and shredded herbs, served with a fresh herb salad and a wedge of lemon. By this time, when we’re beginning to eat our second courses, the wait staff cleared the table of the bread basket and olive oil. We’re a bit confounded as to what’s happening but kept quiet about this. Also when my dining companions finished their plates first and I’m still eating mine, one of the servers took their plates. Not to be overtly fastidious but the latter should not happen until all plates were finished. Since there wasn’t much to pick from the desserts portion of the menu, we had one of each: karidopita me pagoto, fresh fruit and yogurt martini. (The slight issue with service here was the fact the waiter forgotten to give us spoons and forks until a few minutes after our desserts arrived.) 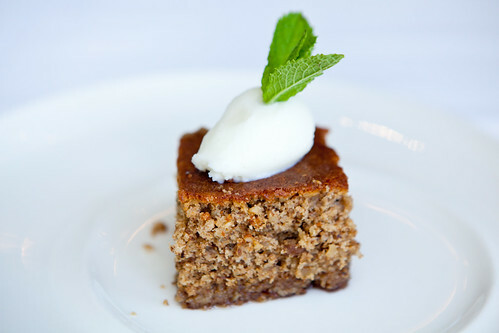 Karidopita me pagoto was a walnut cake lightly soaked in honey syrup and topped with a quenelle of vanilla ice cream and mint. 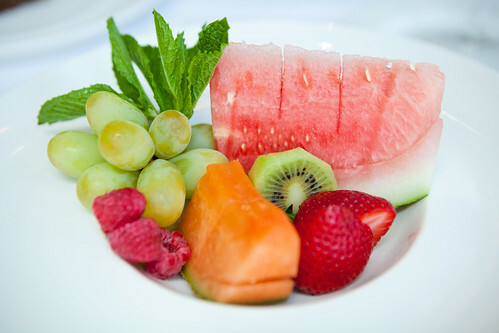 The fresh fruit plate is pretty self-explanatory, consisting of seedless watermelon, cantaloupe, strawberries, kiwi, grapes and a few raspberries. 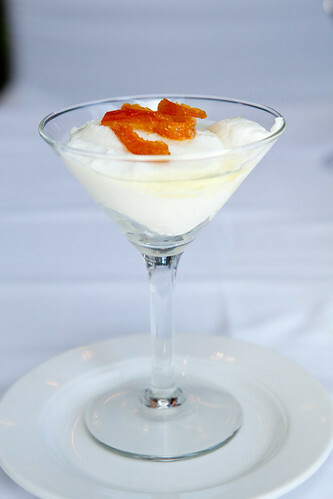 The yogurt martini was super thick yogurt (without the usual tart-tang I’d get when I eat Fage yogurt) topped with candied orange peels and its syrup. All were good on its own terms. Overall, I do like Milos for their simple preparation of food, letting the freshness of the ingredients speak for itself, the atmosphere is serene and airy, and the price is easy on the wallet. I just have a tiff with their service. Even though, who seems to be the manager, walked around the dining room by the end of my lunch (or at the peak of the lunch hour around 1 PM), asking every table, “How is it so far?” in a somewhat insincere/pushy way it seems to me that the service blip started from the top.